The inspector general’s office for the U.S. 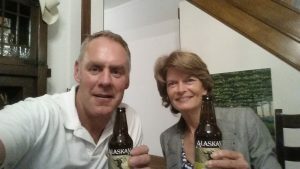 Interior Department has dropped its inquiry into whether the Interior secretary threatened to retaliate against Sen. Lisa Murkowski for voting against proceeding on a health care reform bill. The IG’s office issued a letter saying Alaska’s U.S. senators declined to discuss the matter with investigators and further investigation would be pointless. Nancy DiPaolo, director of external affairs for the inspector general, says the office has no jurisdiction over Congress and she says investigators didn’t ask Interior Sec. Ryan Zinke what he told the senators in a pair of phone calls in late July. “We thought it’d been in the press and because neither senator felt any need to pursue it,” she said. Exactly what transpired in those calls isn’t known. They came after Murkowski voted against proceeding with a Republican health care reform bill. President Trump took to Twitter to complain about her in the morning. By afternoon, Zinke had called both U.S. senators. Sen. Dan Sullivan called the conversation troubling. He told a reporter for Alaska Dispatch News Zinke’s message was clear. Murkowski said the secretary conveyed the president’s disappointment, but she told reporters she wanted to keep the details private. A Murkowski spokeswoman says the senators had no reason to speak to the inspector general because Sec. Zinke did not threaten her. Sen. Sullivan’s spokesman did not respond by air time.